OFFICES of JAMES PAIN & SONS 109 JOHN ST. THE BOMBARDMENT OF ALEXANDRIA &C. &C.
CAREFULLY SELECTED CASES OF FIREWORKS AT $25-$50-$100 READY FOR FIRING A SPECIALTY. R.H. Prince & Princess of Wales. I.R.H. Crown Prince and Princess of Germany. Their I.H. Czarawich & Czarina of Russia. the principal Nobility of Europe and many Municipalities and Towns too numerous to mention. Manhattan Beach from 1879 to Date. The Southern Exposition, Louisville, Ky.
Unveiling at Bartholdi Statue of Liberty in N.Y. Harbor 1886. Toronto Exposition 1884 to Date. The New Orleans Universal Exposition. The Illuminations and Fireworks at Congress Springs Park, Saratoga. Dedication State Capitol Building. 1888 Austin, Texas. or local celebrities connected with the occasion. Suitable mattees in fire bearing on the subject or anything else appropriate to the event. If you will kindly name the sum you think of expending and how many displays you will have, we will forward a programme of the best we ca do especially arranged for the occasion. 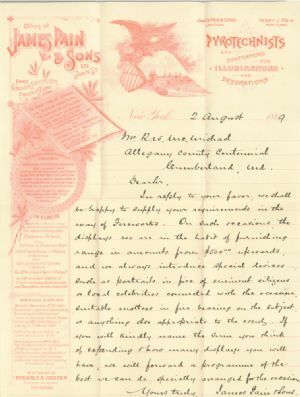 One letter and envelope written in black ink with the letterhead showing an eagle in flight and a description of the company, James Pain & Sons.